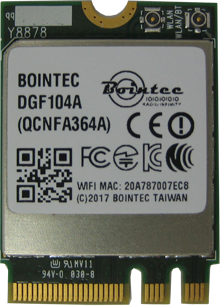 2018.10.24 Bointec introduce the latest 11ac Industrial-Grade combo card. It supports Windows and Linux Drivers solution. DGF104A and DPE104A are using a QCA6174A-5 along with Windows and Linux driver which provide excellent solution for Vehicle mounted front / STB / Automation / Robot, etc. various applications. Adopting the latest 802.11ac solution. DGF104A and DPE104A is ideal for next-generation high throughput enterprise networking and Industrial-graded (-40°C ~ +85°C) solution. Incorporated with advanced security encryption, such as WEP, WPA, WPA2 and 802.1x, it helps prevent user’s devices from malicious attacks. 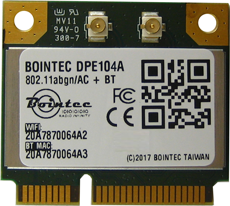 Rather than DGF104A and DPE104A , Bointec DGF109A and DPE109A are commercial grade with an affordable price to offer applications that doesn’t apply to critical environment. 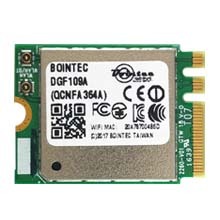 Bointec DGF104A , DPE104A ,DGF109A and DPE109A are an 802.11ac/a/b/g/n Dual-Band Wi-Fi / Bluetooth module based on Qualcomm QCA6174A-5 chipset. This highly integrated module supports most of WLAN capabilities with seamless roaming and advanced security for enterprise application. The wireless module complies with IEEE 802.11 a/b/g/n/ac 2x2 MIMO. The Bluetooth Supports BT 4.2 + HS, BLE and is backwards compatible with BT 1.X, 2.X Enhanced Data Rate. The integrated module provides PCIE Interface for Wi-Fi and USB interface for Bluetooth. The download speed are 300Mbps on N networks and 867Mbps on AC network. Bointec provides leading wireless technology with unmatched support around the world. We have certified the series product are for FCC/CE/IC/MIC to reduce testing costs for our customers. We provide driver support for operating systems such as Linux and Windows. To further expedite the product development process, Bointec also provides additional services including custom driver, certification services.